Protect electronic components from electrostatic interference. BEE Packaging offers a complete line for customers needing static sensitive packaging for electronics and computer parts. Serving the semiconductor industry with component packaging products like static protective shippers for electronic devices, computer parts packaging, anti-static tubes, plastic ic tubes, rubber bands, conductive packing foam, wafer packaging, pink anti-static foam, custom thermoforming, die cutting, JEDEC tays, and grey static shielding bags. 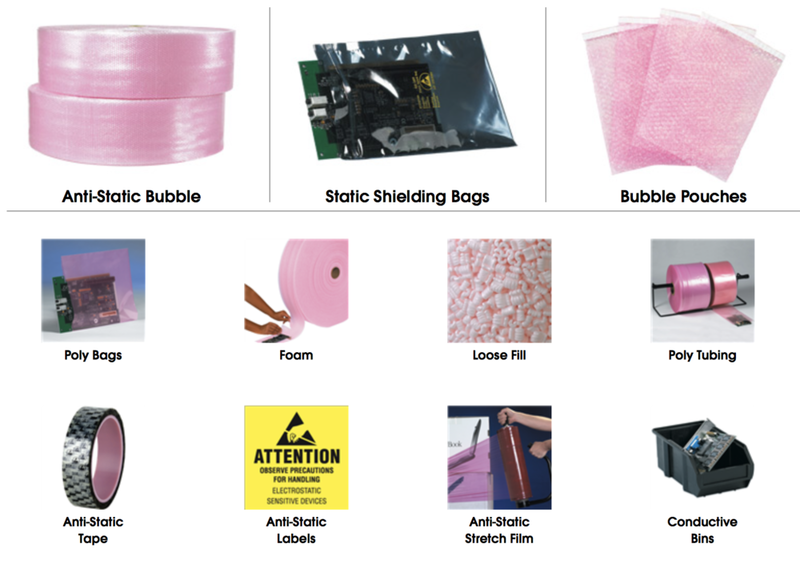 Check out our full line of pink poly anti static bags. Computer chips, electronic operating boards, and various other pieces of technology that serve as the internal framework for a machine are oftentimes incredibly complex, and not to mention, fragile. These devices are strategically manufactured, many of which contain delicate adjuncts and electro-sensitive components that must be carefully protected. Especially during the shipping and handling process, anti-static electronics packaging materials can not only serve as a physical safeguard to the integrity of the parts, but can also prevent any voltaic activity from causing detrimental damage to the circuitry and intricate wiring of the mechanisms. Vehicles are notorious for static electricity build up, particularly in colder temperatures. Even the slightest electric potential transferred to a sensitive computer board can cause irreversible damage to the fundamental parts. When it comes to your valuable product, allow the experts at Bee Packaging to help you achieve the most effective and pragmatic packing solutions for your technology and electronic equipment. BEE Packaging is proud to offer the technology industry’s leading manufactures of parts and components a wide variety of packaging products that will optimize safety and protection during their shipping process. They are dedicated to fabricating only the highest quality materials that will efficiently shield and serve as static dissipaters for your electronic devices. Bee Packaging provides an array of items such as antistatic foam, shaped tubing for wires and slides, rubber bands, customized canisters and cartons that are exclusively shaped for wafers and atypically shaped elements, as well as individualized die cutting and thermoforming for most specialty items. Not to mention, they offer a full line of static shielding bags that are perfect for a myriad of different sized boards and computer chips. Regardless of the shape and/or size of your equipment and parts, BEE Packaging will partner with your company to design the most useful and productive shipping products that are sure to exceed your expectations. Table top label dispensers available stock numbers SL9506, SL9512 and SL9518. Wall Mount label dispensers available stock numbers LDM250, LDM450, LDM850 and LDM1250.